Romantic and bright, this gorgeous sterling silver necklace will add charming sophistication to your style. The open heart pendant is lined with glittering round-cut gemstones in your choice of shimmering birthstone. The gorgeous pendant hangs from an 18-inch rolo chain. All carat weights and measurements are approximate and may vary slightly from the listed dimensions. Treatment code E (amethyst, blue topaz), N (garnet, citrine), CR (cubic zirconia, created stone). See Treatment Guide for further information. Love that it's sterling, stones and affordable. My granddaughter's 12th birthday gift !!! My beautiful little granddaughter is growing up to be quite a young lady and told me she wanted something "mature" for her 12th birthday. She loves jewelry, and her birthstone is the blue Topaz, so I chose this lovely heart with the blue topaz. I was not disappointed. The stones are absolutely lovely and sparkle so beautifully. The look on her face when she opened the box and then the little Velvetine bag that it came in was unspeakable joy !!! She has grown up so much, and it is absolutely beautiful on her. It's a perfect fit on her, and I plan to buy her some earrings to match. I would highly recommend this to anyone. This necklace was much prettier than the Glitzy Rocks sterling silver oval gemstone birthstone leverback earrings that I had also ordered. There were two reasons for sending it back: 1) the turquoise was a pale blue and I prefer the brighter shade and 2) I had no matching earrings to wear with the necklace. Customer service was wonderful, as always, and the return process was completely hassle free. The necklace charm is a nice size and weight. I chose the emerald green. Even though the emerald is not genuine stones, it looks very nice, does not look cheap, and I enjoy wearing it. My wife just loves this open heart necklace!" Bought this for my 2 year old grandaughter. She saw that everyone had something hanging from their necks and she wanted something too!! So grammy went searching for children's jewelry to find the perfect piece for her. When I saw this heart and it was available in her birthstone for May I ordered it immediately!! When it arrived and I saw just how beautiful it was I thought of keeping it for myself..but no I bought it for her. When she came to my house and I put it on her she squealed in delight!! She wears it often, and has to show it to anybody, and everybody who is around. She especially loves to wear it if she is going out with mommy & daddy, and she makes sure that everybody else is wearing a necklace too!! The only comment I have is, that if it is sold as a children's piece of jewelry the chain should be sized accordingly. A 16" chain for a child is way too long..should offer some shorter sizes. I did go to a jeweler friend and he made the chain shorter for her..and now it is perfect!! HIGHLY RECOMMEND. I PURCHASED 1 OR 2 OF EVERY COLOR IN THE SAME STONE-- RINGS. THEN, I GOT THE NECKLACES TO MATCH. I "STACK" THE RINGS ONE- I WEAR 2 AMETHYST RINGS WITH AN OPAL IN MIDDLE..LOOKS GREAT! SO, I GOT THE HEART NECKLACES IN EACH COLOR AND CAN GIVE WITH THE RINGS TO FRIENDS/FAMILY AS "SET" FOR BIRTHDAY GIFTS. I WISH I HAD GOTTEN LARGER SZ FOR MIDDLE/INDEX FINGERS. SZ. 6-7 FITS RING FINGER..MIGHT RUN SMALL THOUGH... HIGHLY RECOMMEND...PUT WITH MATCHING BAND-RINGS AND YOU'VE GOT A "WINNER" FOR GIFTS. CAN'T BEAT THE QUALITY FOR THE VALUE/PRICE!! it looks just like the picture its a good size and color i purchased august and march birthstone both look really nice they make great gifts. does not look like a good stones. just looks like colored glass. This necklace is so beautiful up close. Bought 2 necklaces one had a stone missing and the color was not as it was shown. It was a lilac color not purple. The other necklace was even lighter but I am not able to return it because the one is over 30 days. It is not bad for the price, but the purple stones are much lighter in color than I thought they would be. I was going to give it as a token gift, but I will keep myself because I really don't like the color. Adorable glitzy heart pendant looks SUPER!!! Beautiful settings birthday girl for my granddaughter. Chain is a little shorter then I thought it would be. Overall a very nice gift. I bought this necklace for my granddaughter in her birthstone. It was a perfect size for her beautiful young neck. I was delighted to see her wearing it often. Coming up with gifts for my young grandchildren is a challenge to find something they really like and will wear. This was a great purchase and at a reasonable price. Bought for my 10 year old daughter. She loved it! Absolutely gorgeous. Looks better in person than on screen. I bought in colors for August and November birthstones for granddaughters for Christmas and I know they will be over the moon. Thank you, Overstock for offering such great quality jewelry for decent prices. I would buy again and recommend this necklace. I ordered this in the opal stone. It looks just like it fell out of a gumball machine. No glitz, no shine, even the silver is drab. Not worth even $5.00, certainly not the $11 Overstock wants to charge me to ship it back to them (that's insanity). Do yourself a favor, don't bother with this cheap necklace. I like everything about it. I bought it to go with another piece I have that is alexandrite. "Is the chain and pendant connected together?" The chain and pendant are not connected and can be removed from each other. "if I ordered the wrong birthstone can I ship it back for the right one?" Jewelry, Watches and Accessories We accept returns on jewelry and watches within our Standard 30-day Return Policy. We will only accept items in new, unworn, and non-altered (including sizing) condition. We thoroughly inspect all jewelry and watch items before your refund is issued. Please see our Jewelry and Watch Returns Condition Policy chart below for more details. If your item was damaged during shipping or you suspect possible tampering, contact us immediately. Do not discard the box and/or packaging. The carrier will inspect the box and/or packaging to determine liability. "Why is the blue topaz birthstone in this necklace a very pale blue, while the blue topaz stones for the Glitzy Rocks sterling silver birthstone lever back earrings appear to be turquoise blue? I don't understand this since both are made by Glitzy Rocks. Is it the lighting in the photos or are they different? I want the birthstones to all be the same color." Hello Debra G., U'm sorry for the confusion we may have caused. We are having the images updated. Both of the topaz stones are the same blue. Have a great day! "will I receive this neckless before xmas please"
Hello shiregreen, this item will take 1-2 business days to leave the warehouse and 3-6 business days for delivery. According to these timeframes, you should receive this necklace before the 25th of December. Thanks for shopping with us! 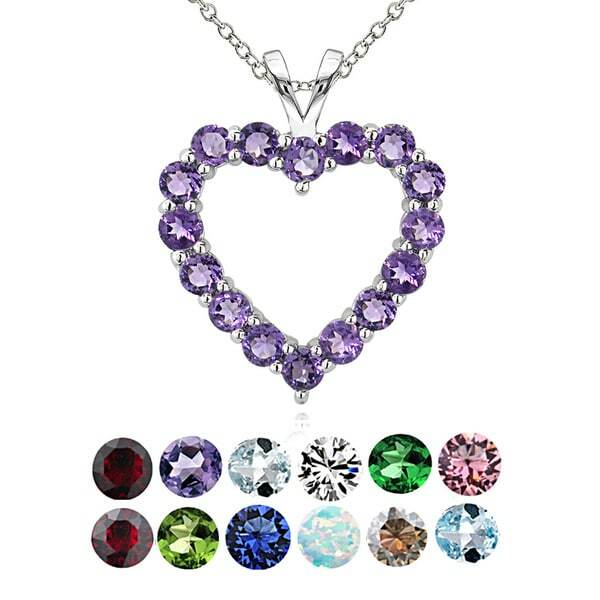 "For the Glitzy Rocks Sterling Silver Birthstone Open Heart Necklace, is it possible to make it with 2 different birthstones alternating hers and mine." Hello luchy123, unfortunately, only one stone can be selected. Please let us know if you have additional questions. Thanks for shopping with us. Want to learn more about birthstones? Get educated on these unique gems and what they mean with our visual guide to birthstones.